Don't forget Barry Viniker is now Benny Royston. The name change was due to identity fraud but his Eurovision Knoweledge remains unchallenged. Barry Viniker has been heavily involved with the Eurovision Song Contest for many years. Following the Contest since 1985, he has been an editor for various Eurovision Song Contest websites, Head of Press and later Managing Director of www.esctoday.com and is now the Metro UK Eurovision correspondent, Chief Editor of ESC Insight sister website, ESC Buzz and provides expert opinion and interviews for a number of radio and television networks including BBC in the UK and SVT in Sweden. Please email ben@benroyston.com for interview requests. For Barry Viniker Eurovision has been in the blood for almost an entire lifetime. He has attended 15 Eurovision Song Contests, working at 9 of them. He has written three official Eurovision Song Contest books – the official fan guide to the Eurovision Song Contest in 2006 2007 and 2008 and has written over 2,500 Eurovision related articles for esctoday.com, Metro UK, ESC Buzz and ESC Insight. He has also contributed comments and insight to many of the leading UK newspapers and radio stations. As explained here, Barry Viniker changed his name to Benny Royston in 2013 as a result of continuous identity fraud. He took time out from Eurovision in order to deal with the problem and since changing his name, has been able to get back to working with Eurovision. 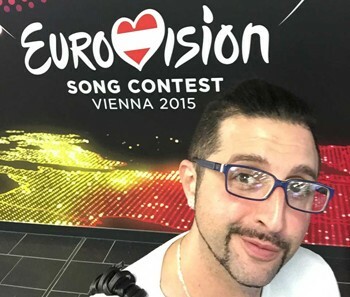 Though he left esctoday.com in 2011, he remains close to a number of leading fan websites including wiwibloggs, which has since taken over from esctoday.com as the most reliable and responsive Eurovision Song Contest fan site. He pioneered the video interviewing at the Eurovision Song Contest, interviewing not just singers and performers but songwriters, competition organisers and delegation heads.